The demands of writing, editing, translating and syndicating hardware reviews plus covering editorials, news posts and site maintenance leave me no more time to write the type of full-length music reviews I used to write when 6moons wasn't as busy yet. Even so, readers who share my love of what generally goes by world music though that's a pretty poor term—does everything else come from outer space—keep asking for a least miniature capsule mentions so they can accompany me on my field trips into worthwhile news finds or rediscoveries in my library. Here I must quality 'new' with 'new to me'. Just because I discover something now doesn't imply it was recently released. It could be older stuff. That's the magic of music. The good stuff is timeless. Heck, aficionados of classical music keep listening to compositions which are a few centuries old. Time and timing aren't of the essence. Selectivity is. Professional music reviews tend to educate their readers with things like genre history, styles, key artists and core recordings which one ought to know of in any given sector. This page isn't that. All that this is are mini mentions of music I happen to have on rotation on any given month. Think of it as sneak views into somebody else's playlists - ours in this case (M&H are Marja & Henk. H is Hadi Özyaşar). 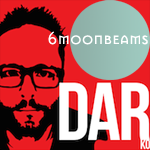 John Darko's 6moonbeams column is what we humorously refer to as "audiophile playlist support". Here are #1 & #2 & #3 & 4. For music coverage of 55 albums from June 2013 - September 2013, click on the album cover at left. For music coverage of 53 albums from October 2013 - January 2014, click on the album cover at left. For music coverage of 45 albums from February to December 2014, click on the album cover at left. 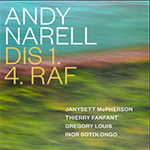 If you're as fond of Andy Narell's steel-drum Jazz à la Fire in the Engine Room, Behind the Bridge and Down the Road as I, you'll likewise have rather impatiently waited out the years for Dis 1. 4. Raf to drop. This glorious and gloriously generous release of thirteen very long tracks is a two-set album with Andy's Parisian quintet of pianist Janysett McPherson, Cuban and Guadeloupe percussionists Inor Sotolongo and Gregory Louis and bassist Thierry Fanfant. The second set becomes a duo between Andy and Janysett. As the liner notes explain, the Afro-Caribbean styles visited include calypso, soca, biguine, son montuno and rumba. With that, this entire gig puts a lie to the notion that white men can't dance. If your body doesn't twitch and shimmy listening to this, you're comatose already. But not only is this infectious fare played between long-time collaborators to be incredibly in the pocket, the tunes build out over long arcs in typically inspired Narell fashion. This is expert story telling from a true master, set to the sunny carefree vibes of the islands. It's unapologetically happy music but very sophisticated at that. Or as I'd put it far more succinctly: "Yo - Andy Narell is baaack!" Grab some Turkish ney à la Başar Dikiçi or Omar Faruk Tekbilek. Mix in ambient groovaciousness à la Mercan Dede or Patrick Chartol. Season with synths which here and there recall early Vangelis. Shake'n'stir. Voilà, Burak Malçok's Saklı Nefes | Hidden Breath. It's a wonderfully mystical-moody construct of low-tempo grooves above which rises the breathy end-blown flute of the Sufis. For complete playback bliss, augmentation by subwoofer can be a good idea to hear everything there really is to hear. It also maximizes the sheer scale of these virtual soundscapes so cleverly manipulated in the studio. 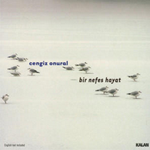 As Burak's second album (the first was Yekpare with Serkan Alkan), it shows greater scope and maturity. It also led Serkan to remix one of the tracks. Frequent collaborator Mercan Dede applied his genius to another. That gives us eight original tracks plus two remixes, all of the quality to become eventual BuddhaBar sightings. As you'd expect for the subject matter, other feature instruments are oud, qanun, trumpet and sundry drums. But always, the soaring flute with the big tone and otherworldly overtone halo occupies centre stage to be our guide into these club-ready but respectfully organic neo Sufi grooves. 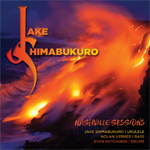 Jake Shimabukuro's Nashville Sessions. We were unaware of more than one kind of ukulele but there are soprano, tenor, baritone and even electrical versions. Playing this album for the first time, an unknown world opened. Hawaii native Jake Shimabukuro is a well established virtuoso on the ukulele which covers just two octaves. Jake's spectrum includes Jazz, Blues, Classical and Folk. To survey his musical escapades, we used Tidal. His Live album is a great starting point to showcase his mastery over the little four-stringed instrument. For the Nashville Sessions he took his collection of instruments and various electronics to Ronnie's Place. Here he met with studio veterans Nolan Verner on bass and Evan Hutchings on drums. In said studio the three men and crew recorded a number of songs in six days. Eleven of them made it to the album. Our copy was on red vinyl to correspond with the red-hot music and the sleeve's picture of Hawaii's active volcano Kilauea. The "Hemiola Blues" opener sets the album's tenor. A high-octane Blues rides on strong rhythms perfect for the jam-session setup. In "6/8" that bluesy Jazz/Rock style sports not an electric guitar but ukulele. Not only on this track but throughout the entire album, the recording quality is old-fashioned great. This album is one of the few that captures a real kick drum. Jake takes the liberty to use styles of other great musicians and weave them together into his own. Echoes of Larry Carlton, Steve Vai, Carlos Santana and even good old Hawkwind pass by. In each track there is a hidden reference to a song or artist. On "Blue Haiku" the timbre of the ukulele is close to a harp with reverb flageolet. "F Minor" returns to a more rocking style with great drumming by Evan Hutchings. "Kilauea" is the appropriate name for the closer which violently erupts with full distortion, then calms to quietness. Nashville Sessions is one of this year's jewels with unusual instruments, great songs to dig one's teeth into and wonderful recording quality without dreaded compression. For the red vinyl we auditioned, that included a high-quality pressing with clean grooves. If you're in the mood for some heavier Jazz/Rock, highly recommended - M&H. 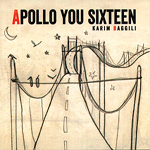 Karim Baggili's Apollo You Sixteen. Guitarist and oud player Karim Baggili is one of Belgium's premier world fusion artists whom we follow conscientiously. He is capable of creating adventurous soundscapes which combine Mediterranean influences with dreamy lyricism. Wonderful recordings are Lea & Kash and Kali City. When you play those two one after the other, you notice a continuity and increasing refinement as if they were one concept album released in two parts. 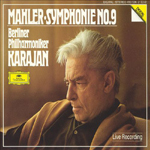 You might even add Traduzca by Karoline de la Serna where Karim plays a strong supporting role (and Karoline is the female vocalist on his own albums). Karim's Apollo You Sixteen now breaks with his previous efforts. Though it contains the same dynamic and lyrical parts, it is not a continuation. Some tracks are in the same style but not taken up to the next level whilst certain melodies recall older tracks. On "Exitimuse" the English lyrics break the otherwise interesting tension of the song. This is in strong contrast with the almost early music like "About Intuition" where Karim's classical guitar is accompanied by Karoline wordless vocalizing. Other tracks like Apollo Recall include electric guitar and keyboards. For us as diehard fans, this album wasn't the hoped-for next level. For those who haven't yet met Karim Baggili, it remains a good start however and a teaser to explore his stronger earlier works - M&H. Marja & Henk review Al di Meola's Eylsium on 45rpm vinyl. Haig Yazdjian's Amalur album has the Syrian composer, vocalist and oudist from Loreena McKennitt's Ancient Muse in fine form, inviting Eleftheria Arvanitaki for "Erimos" and fellow oudist/composer Ara Dinkjian on the closer. 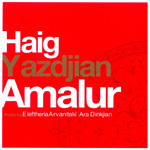 Aside from the electrified "Rudolstadt" celebrating Haig's childhood love of the e-guitar, Amalur is acoustic world music pulling from Greek, Armenian and Arabian sources. Folkloric flute, oud taqsim, modal violin, crossover piano, odd-metered rhythms with hints of belly dance, reedy shanai echoes of the desert, darbuka and frame drum duels... it's all in the hour's work of Amalur. Bracketing the album on the front end is "Fog el-Nakhel" which slinks in on a sinuous groove before multi-tracked vocals put lyrics to it, then massed strings drop in for some Egyptian flavour. It's a golden track which fully deserves its opener status. Next Greek goddess Eleftheria takes us on a trip to some faraway island with a 6/8th quasi waltz that's full of summery fragrance and charm. After many more adventures, we close out on what begins on a stately dark Sufi note with the moodily mystic "Ara" that evokes whirling dervishes in a worn black'n'white photo. Before it's over, that has morphed into full-colour double time on a grand scale. If all of it set you on a happy trail, go for seconds and thirds with Haig's other albums Garin and Talar. The Secret Trio with Tamer Pinarbaşi on qanun, Ara Dinkjian on oud and Ismail Lumanowksi on clarinet are NYC's answer to the rousing success of Turkey's Taksim Trio. As the latter have two recorded outings, so the former recently launched their #2 with Three of us. 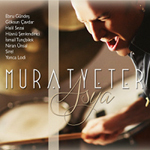 The Turkey link is further emphasized by the phenomenal guest artists Sezen Aksu and Erkan Oğur, each on one track. With Ara's vast library of self-penned compositions—just think on Eleftheria A. 's The Bodies and the knives album—it's no wonder that the trio revisits some here. But we also get takes on the classical "Prelude in E minor" and "Hungarian Dance N°5" just as Hüsnü Senlendirici saw fit to include the "Adagio in G minor" on his latest solo album. Whenever three acoustic instruments can sound like more, one is in good hands. When they can also let silences speak louder than 16th-note passages, even better. The Secret Trio are masters of both, with Tamer's qanun in the role of harmonies provider like an exotic harp piano. Advanced Middle-Eastern chamber music of a mostly introspective lyrical bend, Three of us is more of the very good thing begun with their first album. The mix of timbres, the virtuoso headroom of manual dexterity each instrumentalist brings to the table, the obvious camaraderie in their give'n'take, the wealth of memorable melodies... these three invite us to partake again and again. Take Arabia's most successful male Pop singer, Amr Diab. Have him pen twenty vignettes of Muslim prayers each shorter than 2 minutes, each on a different name of God. Record it with typically gloss production values and excess reverb. Include Amr's multi-paralleled background harmonies but do eliminate all percussion and keep your instrumentation sparse. Voilà, Mn Asmaa Allah al Hosna, an all-to-short album that features the famously honeyed but jubilant voice in a sacred context. It's an answer to wondering what some of our premier Middle-Eastern voices would sound like were they extricated from their typical Top 20 contexts dedicated to dancing bubble-gum chewing youth. Transplant them instead into a more classicist milieu. I've wondered the same about Elissa, Kadim Al Sahir and scores of others. With this gorgeous album as precedent, here's to hoping that many more will follow. You obviously needn't be religious or partake of the lyrical context to feel this music. Simply listen. It exposes you to another culture's faith expressed artistically. That bypasses all the stress in the daily news. Whether it's Händel's Messiah, Mozart's Requiem, a Quawwali group honouring a Sufi saint or Amr Diab leading figuratively from the minaret, it all points at a shared depth which transcends creeds and cultures. Musicians could teach politicians a things or three. This is plain beautiful! 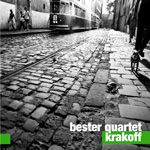 Like Swiss colleagues Kol Simcha who became The World Quintet, the Cracow Klezmer Band became the Bester Quartet. Like Astor Piazzolla's tango was a clearly concertized form of raw Argentine dance music played first in seedier clubs, so the Besters apply their considerable instrumental chops to music that's only loosely related to folkloric Klezmer. Instead it's become a type of advanced contemporary Yiddish chamber music. There are obvious connections to John Zorn whose compositions they interpret in their former incarnation on Balan, Book of Angels Vo. V. The live recording of Krakoff on EMI Poland has each track end in appreciative audience applause. 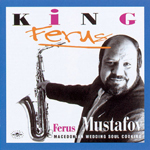 It mixes up double bass, violin, clarinet/bayan/duduk, two accordeons and percussion. In their own way, these often high-speed exploits recall the Turkish Balkan Messengers around fiddler Nedim Nalbantoglu and accordeonist Neshko Neshev. The level of virtuoso artistry and musical intelligence operates on the same plateau. As such it isn't about so-called easy listening. It's not formulaic Pop of even exotic stripes. The Polish band plays it generally moodier, darker and edgier than the more happy-go-lucky Swiss; another reason for the Piazzolla reference. With eight strong albums under their belt, it's a formation you ought to know about; and Krakoff makes an excellent spring board from which to dive into these waters. Tidal has it. With trepidation, after a five years' absence, we have a new CD from Mariza. Trepidation? On my part because I see it produced by Javier Limon who also did Terra. He's also done Concha Buika, even Paco de Lucia! I must be a traditionalist of sorts because the addition of annoyingly scuffling percussion and trumpet adds nothing to the package except to diffuse the music; at least to my ears. I feel the essence of Fado in the sparse sounds; in the voice singing mainly of melancholy supported by the plangent Portuguese guitar fills and subtle backing of a rhythm guitar, plus possibly a bass. The simplicity of the sound highlights the voice. It certainly does in Mariza's case. Add the subtle variation in speed, the pauses, the interaction and it all makes for a perfection I feel is marred by adding extraneous improvements. I suppose that it must be hard for a producer not to add things. They must throw them in, somehow. Look at how Jacques Morelenbaum, a respected producer in South America, added totally superfluous 'sniveling of strings' (copyright Alex Robinson of Songlines) to everything when producing Mariza's Transparente ( a misnomer when it sounds anything but transparente). I even read that he originally had no knowledge of Fado. It shows. He merely treated it as salon music though much of the world seemed to like the album, thinking that strings equal class perhaps? But listen to the Concert em Lisboa CD. How awkward the strings try to deal with Mariza's stretched phrases and dramatic pauses. She's easy to follow with a small group of accompanists, not at all with an orchestra. This is how I feel about Limon's addition of drums, mainly brushwork, which on first hearing had Terra sound like mice scuttling in the corners. How I wish they could follow Confucius' advice to a new emperor: Do nothing and the country will flourish. On first listen to Mundo, my fears felt partly justified. There are even three tracks with choral backing, sounding like normal ballads; and two that fade out. Fado nearly always ends songs with a flourish. 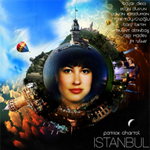 On Istanbul, Frenchman Patrick Chartol who lived in Turkey for four years—where he then worked for Sertab Erener, was a member of the experimental Rock band Nekropsi and created Rong Duni with six Turkish gypsies, Harem's percussionist and an Indian vocalist—surrounds himself with top session players from the city's contemporary scene. This includes Bülent 'Kirpi' Altinbaş on clarinet, Adnan Karaduman on violin, Başar Dikici on ney and more. 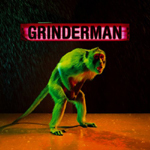 Stylistically, this album falls into the organic/ambient Mercan Dede groove as hinted at with the cover art. There simply are no synthetic club elements, no 21st century disco remnants. We do get Harem-style djembe rhythm carpets which support Indian santoor and singing solo bass guitar over repetitive piano figures. We get free-form ney that's entirely divorced from its Sufi roots like John Kaizan Neptun did for the Japanese shakuhachi. We get slinky slurry violin that soars above finely minced percussion and string synths for subtle ambiance. We get a spacy new-agey groove as backdrop for qanun and kemanche meditations which are interspersed with some grounding infra bass. And so it continues across a generous helping of tracks - downtempo moody instrumental music from Turkey served up with panache and real atmosphere. 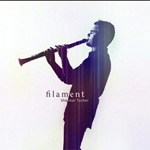 Filament is a showcase for Shankar Tucker, an East/West clarinetist of rare stripes who built a solid classical foundation at the conservatory with Tom Martin of the Boston Symphony; then pursued a grant to immerse himself in Hindustani music with Hariprasad Chaurasia at the latter's school in Mumbai. Besides the blackwood, he also plays the piano, bass, kanjira, tabla and sundry other percussion instruments. The most unusual aspect about him is that he does take classical Western clarinet technique and migrates it seamlessly into contemporary Indian crossover music where vocalists riff on Eastern scatting whilst they're being shadowed immaculately by the paralleled Shankar. Athletic improvisational elements know to us from Jazz seem to factor as well. This cooks up a mash that's decidedly modern yet clearly Mumbai. And, that novel recipe comes off as polished and cogent as do Polish flamenco guitarist Michal Czachowski's two IndiaLucia albums which duel up Spain and India; or El Cigala's various immersions into Cuban, Andean music and tango. As one is with the Olympics which reset athletic limitations, observing contemporary crossover music pushes boundaries on raw technique and stylistic inventiveness. As such, we witness the rise of new sub species. Whilst plant and animal species die out at alarming rates, new musical forms are on an ascendant to be biblically fruitful and multiply. The Khoury Project's Revelation album is top-drawer Arabian Jazz of the highest order. It's set inside a traditional taxim trio context of violin, qanun and oud to which are added percussion and bass. On quality of execution, it simply doesn't get better. Think Renaud Garcia-Fons crossover; or Joseph Tawadros exploits with Bela Fleck. Hearing the traditional qanun do a 'gotcha' chameleon into blue-note inflected high-speed Jazz workouts or on-the-spot detunings is a real mind bender. With the violin, we've seen quarter-note modal Jazz blends from Nedim Nalbantoglu before. Here we're on that exalted level, albeit without the Balkan elements. Another pointer would be the Arab/Hebrew Bustan Abraham ensemble of yore. This means generously long tracks to give the musicians plenty of space for thematic explorations through various time shifts, each of them opportunity to let loose in solo improv. Just how far out they veer before linking up again with a track's melodic core in unforeseen ways which feel perfectly inescapable in hindsight is one of the many pleasures to be had. Despite very obvious 'horology' complications on a technical interplay level, this expanded trio makes it all seem very simple; a clear sign of advanced mastery. My favourite find of 2015 thus far, in a year that was far from stingy on that count! 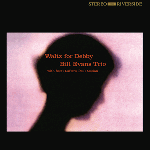 Bill Evans' Waltz for Debby is a classic poem in the Jazz idiom. Bill once said that "you can't explain Jazz to anyone without losing the experience because it's feeling, not words." This Jazz poet of the delicate spirit resembles another poet, the Italian Cesare Pavese. Pavese wrote of melancholy with the pen, Bill Evans with his fingers. Neither spoke much nor do we many photos survive which show them smile. Both cared about the people in their lives and experienced great pain when they lost them. Pavese was unhappy without his women, Bill Evans without his friends. Pavese couldn't deal with his pain and killed himself which Bill Evans followed more than 20 years later with drugs and the longest suicide in history. As the pianist said in general, Waltz for Debby is a unique Jazz outing expressed not in words but feelings. This record immortalized a June 1961 Village Vanguard performance with his first trio which played to a bunch of lucky folk. Paul Motian was on drums, Scott LaFaro on bass who tragically lost his life 2 weeks later. Opening with "My Foolish Heart", we understand why Evans suffered depression and loneliness after LaFaro's death. The song is proof of their deep connection and magnificent harmony. LaFaro didn't use his bass as just a rhythm instrument but far more formidable lyrical tool. Evans' calm melody purrs, his hands express timidity. Motian's brush romances his cymbals like a water colour to suggest moon light falling onto the Village Vanguard stage. Jazz's best valse ever, "Waltz for Debby" is Evans' dedication to his niece. Its swinging character struts a curvy melody and fluid tone envelops us in water. "Detour Ahead" was composed by Lou Carter, Herb Ellis and John Frigo who called themselves the Soft Winds. It's a standard often interpreted by woman singers. Here Evans and LaFaro knead it like pliable dough whilst Motian caresses his cymbals. LaFaro seems to preview his own traffic accident with "smooth road, clear day, but why am I the only one travelin' this way? How strange the road to love should be so easy, can't you see the detour ahead?" When "My Romance" opens with soft piano, Evans suddenly rambles maniacally and Motian scolds him with the hardest hitting interlude of the album in a ravishing exploit of brush and drumstick. After LaFaro soothes things with a short solo, Bill and Paul wrap up the track with a fast rhythm. 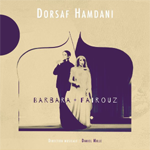 Dorsaf Hamdani is a Tunisian singer who started young, then graduated from the Musical Academy of Tunis, performed with many great Arabic and symphonic orchestras including the Cairo Opera to eventually collaborate with Salah Goubachi and Selim Sahab, two contemporary masters of Arabian music. She began collecting awards, including the 1996 Golden Record of Tunisian song. Subsequently she pursued a Ph.D at the Paris Sorbonne where she also enlarged her musical vocabulary. This is reflected in the self-explanatory Barbara.Fairouz. Once again she explores the legacy of Fairuz, that most famous of Arabian singers next to Oum Kalsoum and Asmahan just as she did on 2012's Princess of Arabian Song. Yet here she mixes this classical repertoire with six numbers by Barbara and with French lyrics to honour her post-graduate immersion into Parisian culture. In pure chamber-music style she is accompanied on guitar, oud, violin and by accordionist Daniel Mille who also wrote all the minimalist arrangements. Hence no saucy Egyptian string orchestra or hand drums of any sort. With high production values for excellent sonics this album is a sterling discovery for lovers of truly elegant female vocals which are placed centrally to make everything else subservient to them. First-rate compositions masterfully pared back to their essentials gild the same lily. Gorgeous stuff! 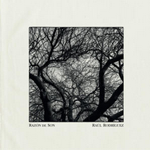 Razon de Son is the first solo album by former Son de la Frontera lead guitarist Raúl Rodriguez who also is a producer and anthropologist. 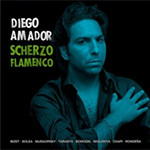 Here he resets the clock of Flamenco's history even farther into the past to inspect its North-African roots which informed early Flamenco via the Andalusian sea ports of Seville and Cadiz; and its eventual reach into Latin-American colonies like Cuba and Peru to develop rhythms like the Cañas, Indian Fandangos, Peteneras, Sonerias and Punto Flamenco. This combines Raúl's vocals with his trademark Cuban tres guitar which was gifted to him by his mother Martirio, a famous singer who'd performed with Compay Segundo in Havana. Raúl single-handedly introduced the unique bright timbre of this Latin guitar to Flamenco and plays it by mixing styles of son cubano and Flamenco toque. Add Marios Mas on regular guitar, Guillem Aguilar on bass and Aleix Tobias and Pablo Martin Jones on richly layered percussion and you've got an exotically flavoured brew with echoes of Africa burning through in the tribal rhythms. Like on his prior work with Son de la Frontera, the overall spirit is dark and raw rather than shiny and polished to mark another true return to compelling ethnic roots music, albeit of a sort we've not heard quite like this before. 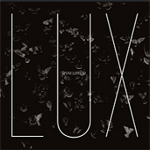 If you thought Norwegian female vocals stopped at Kari Bremnes, you might want to give Lux by Unni Løvlid a spin. With the very outside bass of Håkon Thelin providing strangely moody soundscapes for her voice, Løvlid's broad expressive range from whispers to assured Nordic power and a vocabulary which stretches from Schoenberg to folk song make for a quite otherworldly journey. Whilst a particular melody might suggest an Irish plain song, Håkon's bass will run scratchy arpeggios up into the flageolet beneath and around it to alter that mood into something indefinably suspended between light and darkness. This weirdly unmoored state of suspension is further abetted by the absence of regular beat keepers. There's no percussion nor is the bass used in any such fashion. Instead the bass whines, creaks, rattles, smears, squeaks, rings and spins like an off-tune Tibetan singing bowl or howling wind whilst stately vocals might bid farewell to a band of Vikings disappearing in the grey fogs. Despite its bright name, Lux is filled with the tension and contrast which only come when darkness is equally present. Think ghostly, eerie, other and prepare to be transported. Tárkány Müvek are a Hungarian folk band led by cymbalom player Bálint Tárkány-Kovács who perform at the intersection of folk and advanced jazz. Ószi Vázlatok is a live recording which covers repertoire from their two prior albums plus covers like John Coltrane's "Naima". Old-timer Mihály Dresch on saxophone and shepherd's flutes insures that the general vibe keeps pointing at the more abstract Jazz aspect. In the context of the unusual instrumentation and foreign lyrics, this makes for significant perceptional frisson - that Jazz should have spread this far and in turn been informed by Eastern European sensibilities. If you mean to take a walk on the wild side of Manhattan's Jazz Avenue, Ószi Vázlatok makes for a good excuse. The two-stringed erhu fiddle is a classical Chinese instrument of which an entire solo album would likely be too boring for Western audiences. 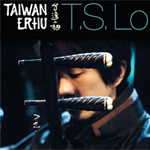 Tangh-Suan Lo's Taiwan Erhu concert recording thus limits the traditional solo or minimally accompanied pieces to five before the specially formed 21st Century Taiwanese Chamber Ensemble adds forces and timbres with the yuangqin hammered dulcimer, sheng mouth organ plus cello and accordion from France. That's when the next ten cuts take unexpected detours. Those lead "Pink Clouds Chasing The Moon" to turn into a slow Parisian musette vals. "El Choclo" becomes a tango for erhu, "Gymnopedie N°.1" nods at the clever French minimalist Satie, "Duke's Place - C Jam Blues" becomes a curious Jazz limp, "Gypsy Promenade" returns us to the musette vals, "Klezmer Party" has the accordion suggest some Balkan elements and "Erhu-Cello Dialogue" delivers what it promises. What on paper might have read like nothing but an ill-fated project that was pitched in two minutes over a hurried lunch turns out to be a very elegant example of modern chamber music. It plants the refined stately timbre of the Chinese erhu into new patches of soil to blossom for us here in the West. That's the real meaning of crossover! 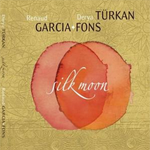 Renaud Garcia-Fons, master of the virtuoso five-string upright bass, and Derya Türkan, maestro of the Persian spiked fiddle called kemanche, are the protagonists for Silk Moon on which the two illustrious musicians reunite who'd already worked together on Türkan's 2006 Minstrel's Era with Uğur Işık on cello and oud. For some Silk Moon tracks, the French bassist contributes the type of overdubbed loops that turn his bass into percussion and which also featured on his Marcevol Concert Solo disc. Gentle palmas and massive frame drums underpin others. But in general, Silk Moon consists of pure duets between two stringed instruments played con arco or plucked. Unlike the haphazard meets Kavi Alexander of Water Lily Records pursued in the past by inviting two master instrumentalists to jam ad hoc in a church whilst recording their impromptu musical (mis)dialogue, all fourteen cuts of this album were clearly composed through in advance to end in carefully crafted arrangements. By having two very mature musicians join forces, neither of whom have anything left to prove, the focus is on lyricism, subtlety and saying more with less. Jyotsna Srikanth's Call of Bangalore showcases the violin in a classical Indian trio setting with mridangam and kanjira. She plays this instrument which was introduced to the Indian subcontinent by the British in the typical sitting style, scroll resting on her knee. Her idiom is Southern Karnatic based on 72 ragas or musical scales. But she's also a qualified doctor with a medical degree, a violin teacher, curator for the London International Arts Festival, frequent contributor to Bollywood soundtracks and involved in many fusion projects like Bangalore Dreams which joins her with Indian and Western rhythm sections, Chris Haigh on violin and Shanti Paul Jayasinha on trumpet. 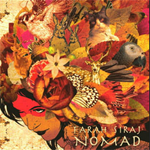 Her multi-tasking interests translate into exceptional stylistic fluidity which also informs her playing when she focuses on her classical Indian core training as she does with this album. 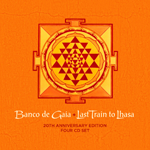 Being released on Riverboat Records/World Music Network means far better recording quality than is sadly typical for many Indian music productions. And unlike the electrified violin of L. Subramaniam, Jyotsna plays hers unplugged to let us enjoy the authentic timbre of her chosen instrument. A gem for lovers of Southern Indian music. 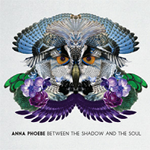 A violin of a very different sort is Anna Phoebe's on Between the Shadow and the Soul. Coming from the prog-rock Trans-Siberian Orchestra and having played with Jethro Tull and Roxy Music, she's as comfortable with full-on electrified onslaught as she is with the classicist piano/violin duet form. That's the fusion of global rock on tap here. It culminates in the central 6-minute anthem "A Moment's Deception" which begins with a simple revolving guitar riff, tablas and high-register violin chords. Things crest into the obligatory furious e-guitar solo, fall back into an interlude featuring Phoebe's friend Ian Anderson's flexible flute, pick up momentum with hammered guitar chords, jubilant violin swooping like a hunting falcon and Anderson's overblown flute before dying down. "Embrace" goes fully unplugged for an elegiac embrace of concert grand and violin song with big emotive sheen and a saucy vals interlude which show real expressive scope. Directly following, "Uncrowned" kicks off with aggressively pounding drums and shredding e-guitar chords for maximal contrast ratio. "Inception" uses a drums'n'bass foundation overlaid with tablas against which the violin does slinkily ornamented odd-metered melodic work before the rock elements dominate again. Between thus isn't the usual setting for the violin, showing just how much scope this instrument enjoys outside the classical and Jazz milieus. 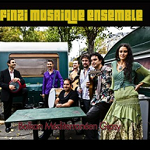 The Finzi Mosaique Ensemble are spiritual kinsmen with the French Bratsch formation because they canvas the wider Mediterranean up deep into the Northern Balkans for Roma and related folk repertoire. 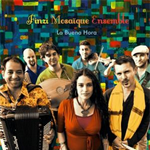 The Balkan Mediterranean Gipsy title of one album and La Buena Hora of the other say it all. That means violin, oud, accordion, clarinet, sax, bass, hand drums and female vocals. It means elements of Arabo-Andalus Moorish music, various hora and sirba dances, ornamental Turkish taksim interludes, Macedonian wedding echoes of Ivo Papasov and Yuri Yunakov, Taraf de Haïdouks mayhem, slinky belly dance rhythms and visions of traveler wagons and juergas around night fires.